The most dismal week of the 2,340 odd that I have spent caring too much about Norwich City was in 2013, as October became November. On the Tuesday night, the lovely Mrs Dennis and I watched a 4-0 League Cup defeat at Old Trafford. Four days later we sampled the delights of the M1, M6 Toll and M56 once more to watch Chris Hughton’s team lose 7-0 at Manchester City in the Premier League. Miles driven that week: 750. Goals conceded: 11. Goals scored: 0. Smiles from Mrs Dennis: 0. Rude words from Mr Dennis: innumerable. There have been other, seriously wretched occasions, of course. Many of them were more significant milestones in Norwich City’s oscillating journey through the divisions. But, for the feeling of downright, depressing futility, those doleful days four and a bit years ago were my personal nadir. So what’s the point? Seriously, why are we all getting so excited about where City sit in the Championship? The Premier League is supposed to be the “promised land” but the promise is of some more soul-crushing misery. Look at Huddersfield on Sunday. Their promotion — led by a German coach appointed by Stuart Webber — was the model we have copied. Their survival in the top tier last season featured the heroics to which we aspire. But there they were on Sunday, cannon fodder for Manchester City, rock bottom of the Premier League and ten points away from the potential safety of 17th place. And look at the two clubs currently in the other Premier League relegation places: Fulham and Cardiff. These are the two clubs who were relegated with City in 2014, and while we spent the following season closing in on Wembley, they were making removals firms very rich. Cardiff got rid of a staggering 44 players in 2014-15 and recruited just 18 replacements. Fulham let 16 players go on free transfers after relegation: decent players including Steve Sidwell, Brede Hangeland and Kieran Richardson departed without a single penny coming in. For both clubs, the single objective in that first season down in the Football League was to get their biggest earners off the payroll. Can you imagine what it felt like for Fulham supporters when Harry Winks scored Tottenham’s last gasp winner at Craven Cottage on Sunday? Can you think what it was like for Cardiff fans the previous day, seeing Newcastle win to leapfrog above them and out of the bottom three. Even Neil Warnock’s mysterious eyebrows looked distressed. Of course you can imagine being those fans. You’re a Norwich supporter. You’ve experienced stuff like that many times. But there are other experiences we’ve all shared, too, following Norwich. Indulge an old codger now as I wallow in a little nostalgia. Let me start with the time I found myself cheering Captain Canary. In the second half news arrived — probably via somebody’s transistor radio, this was so long ago — that West Brom were losing heavily at Stoke. That meant Nigel Worthington’s City would be champions come what may. So the party started, with about 2,500 Yellows yelling. City lost 1-0 that night, but it didn’t matter a jot. I delayed my return to my grotty hotel by driving around Sunderland with my NCFC scarf out of the window, hooting my horn: a pathetic but utterly exultant one-man victory parade. Sadly, 375 days later, on the final day of the 2004-05 season, City slid back to the second tier with an ignominious 6-0 humiliation at Fulham. That was the end of our first season in the top division for 10 years. It became City’s last for seven years. And, worse, City slumped into League One. Then Paul Lambert happened. A two-season crescendo of excitement climaxed at Fratton Park. This time it was a Monday night in May, and the only particularly embarrassing thing I did was to dance an arms-linked jig of joy with total strangers in the Gents at the away end. That was followed by not one, but three seasons in the Premier League. They ended, effectively, at blooming Fulham in May 2014 when the only winnable game left to us featured a flaccidly impotent afternoon for Ricky van Wolfswinkel. It hurt. But one year later there was unforgettable Wembley glory as Alex Neil’s vibrant team beat boastful Middlesbrough before they knew what was happening. Oh, but Neil’s tilt at the Premier League yielded just nine wins. There were very few occasions that season when any of us felt like cheering a bloke dressed up like a fat, yellow bird. Here’s the thing, though: that completely crazy but profoundly purgative roar of delight at seeing Captain flaming Canary at the Stadium of Light in 2004 was only so brilliantly cathartic because it was proceeded by so many grim disappointments. Dancing in the bog at Portsmouth in 2011 was pay-back for trudging home in a black funk from Charlton in 2009 as City crashed into League One. And being with my family — and being part of the Norwich City family — at Wembley in May 2015 was so life-affirming because the City faithful had been just that: faithful through some oppressively dark days. So my personal credo is that the whole point of supporting a football club is the tribal sense of belonging — of being part of a community — which is forged in adversity as much as it is in triumph. Families fall out, of course. But at the moment we’re all united by being City. And I happen to believe that we’ll be OK this time if we get into the Premier League. We shouldn’t forget that the young academy players currently strutting their stuff in our first team were spotted, signed and nurtured by people, many of whom are no longer at the club. And they rose through a system put in place by a chief executive who has also left. Without David McNally we would not have a category one academy. But the courage to blood the kids and to keep them in the team — the belief that pitched Max Aarons into a Championship debut at Portman Road, for instance — is part of a philosophy which has been constructed by Webber and Daniel Farke and which fits hand in hand with a very impressive recruitment record. Study the current side — stuffed with men like Emi Buendia, Mo Leitner and Marco Stiepermann — and acknowledge that the scouting and signing protocols have been revolutionised. A third ingredient of the philosophy is the style of play. At the Birmingham game, a guy who sits near my wife and me shouted: “Get rid of it!” It was the dying bellow of a lone dinosaur. My shouted answer was: “No! Keep it”. Taking care of the football will serve us well in the top division, I am sure. But we’ve got to get there first. And the next couple of weeks are as important as any in the 2,340 I have endured. What’s the point of caring so much at the moment? The point is, as fans, we’ve had a thin diet since Wembley and now there’s another feast in sight. I’ve had enough adversity. I want my share of triumph, please. I feel like I did that night in the Stadium of Light. We can do this. We can flipping do this. YESSSS! Come on! Nice to see you back Mick. My number of weeks of joy and pain are similar to you, starting around the time of our promotion to the old First Division in 1972. You are right about the perils of being promoted to the Premiership. It is sobering to think that even if we get there, the height of our expectation would be to finish 17th. Halfway through the season, every game will be billed as a ‘must win’ and a manager who has achieved a virtual miracle, like David Wagner or Daniel Farke will be vulnerable to the sack. Even if we do fall a bit short this season, I hope everyone will see that the club is moving forward and has adapted to survive. There are certainly worse things than another season in the Championship, as our friends south of the border will soon be finding out. Brilliantly sums up the life of a Norwich City supporter. I now live in Australia but both my daughter and son are committed and love being the odd ones out here amongst the Liverpool and Man Utd fans. We have our canary’s sticker on our car in Canada’s and try to explain to all the Man U fans who Norwich are! A very entertaining and quality read. I’m of similar vintage to Mr D and THAT Steve Bruce header against the Binners and the way we stunned Boro at Wembley with a clinical early onslaught at Wembley are top of the shop. As was the moment Clive Walker fluffed his penalty in 1985 in the Friendly Final. So too watching Simeon Jackson’s finish against Portsmouth from a sublime David Fox cross in The Railway Tavern in Coltishall. I’ve never been so happy to be soaked in beer and landlord Dave (a Liverpool fan) broke out the champagne for us regulars afterwards. We partied into the night. Strangely my actual favourite moment was at the Carra when we played Coventry in the last game of the season – having already secured promotion to the Championship – and the whole of the Barclay and Snakepit repeatedly singing “Oh Sammy Clingan it could have been you” when he came to take their corners. Whatever transpires this season it’s been so refreshing to watch. This. For every down turn there will be an exciting time just around the corner. And even after relegation, a couple of games into the new season and it’s practically forgotten especially if we start well. On my return with family I found myself one strange Saturday afternoon at THE CARRA watching the football team I had supported from afar. I recall the Sunderland game well. Had a ticket for the original fixture which got called off by the time we got to Wetherby. It made the night of the actual game even more special. Loved reading that Mick, you’ve summed up support, what it means and how it feels so well…you ought to write for a living! …that sums up football and Norwich City so well. We hold on when there is next to nothing left, we have the will to cry out “Hold on!’ Its what we do. I once argued with someone that I reckoned that most Norwich fans got more pleasure and delight out of winning a well earnt 3 points than many a fan of a big club did after yet another trophy was lifted by whoever their £250,000 a week badge kissing Captain that week was. I still believe that. The ups and downs are part of that. Bless them both. Brilliant read Mick; thank you. I must have been following NCFC for around the same time. I agree with Martin that one particular highlight was THAT Steve Bruce header, and I can also remember the disappointment when the Chelsea semi-final at Carrow Road was abandoned with less than 10 minutes to play. OK, so we won the replayed game, but for me that particular night was a nadir. One of my particular recent highlights was the Steve Morison goal at the Emirates which brought us a well deserved point from a 3 – 3 draw in a really pulsating Premier league game. As for the next 2 fixtures, it’s an anomaly of the points system where I think we’ll be better off with 2 points rather than 3. However 4 would be great, and 6 just fantastic! I was at that that game too and I was in with their lot – we’ve all surely got at least one Arsenal mate – I’ve got about six! I never mind sitting with the oppo when I’m with personal friends and the old Highbury was even better than the Emirates – they were one of the very few clubs to attract a diversity of support back in the day. That didn’t really happen at Spurs or West Ham. Whenever they come here they sing “you’ve only come to see the Arsenal”. Which is over the top cheeky but I’ve always found the Gooners to be a pretty decent bunch of supporters. That was one of the better games I’ve seen and you’re right – even Steve (not Mr Morrison) and Karen admitted we were worth our bounty that day. I wasn’t around for the “Chelsea fog” but folks still talk of it to this day. Always remember the Police Band at the old Highbury marching all over the pitch at half time no matter the weather. Ex Yarmouth boy from the Alderman Leach School was in their double winning side Peter Simpson was at the White hart lane when they won the title. Another great piece Mick which stirred a few memories (good and bad). I was also at Sunderland and then at the Craven Cottage ‘no show’ the following season when I could have happily strangled a few of our team who took the opportunity to show us that they weren’t really that bothered and weren’t going to stay at City in any case. I’ve been going to Carrow Road since 1962 so could easily dredge up some more highs and lows but I’ll leave that for now. I’m absolutely with you on your optimism that this squad could give a better account of themselves in the top flight than previous incarnations should the opportunity arise. I happen to believe that what I’m witnessing now is a group of players who are all extremely gifted in their technical ability and coupled with the undoubted spirit that Daniel Farke has instilled the sky really is the limit. A couple of years ago I had a brief exchange at the AGM with our previous manager regarding his unwillingness to play our most talented youngsters in the shape of Maddison and Pritchard, When I suggested he didn’t trust them, his response was ‘they’re for the future’. Thankfully his future with us was limited which brought about the change of direction we’re now enjoying. I’m pleased to say that Daniel has no such concerns regarding the youth and his bravery has been rewarded, Stuart Webber told us it would take three or four transfer windows to recruit the required staff to get the job done, that seems to be bang on track and I’m certainly enjoying the journey. Some of the football played by teams under John Bond and Mike Walker was really enjoyable to watch but this current crop at times can take it to a new level. 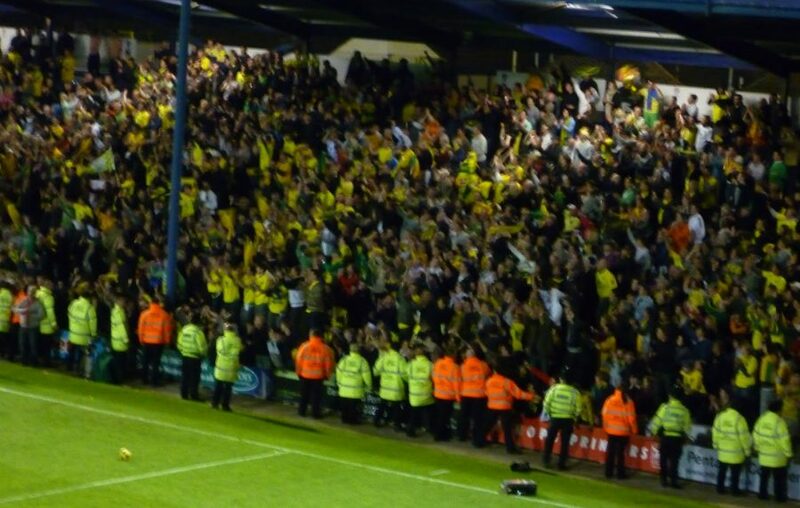 I don’t know how many times over the years I’ve replied to my missus when she asks “Why do you keep going when you know it’s gonna be rubbish?” ….
. “The bad times make the good times soo much better.” OTBC!!! If I live to see out my average life expectancy and things go as they have for the last 45ish years of supporting Norwich I will have a few more promotions to celebrate. The price worth paying for such joy is that there will be some relegations as well. I admit to some happy clapper credentials (not when I’m watching the game-I admit to twerp credentials then) but I don’t get too depressed when things are going badly; missing out the Sunday paper sport section is about as bad as it gets. This is rapidly becoming one of my favourite seasons and the team effort (on and off the pitch) to get to where we are has been absolutely awesome-some day books will be written about it! It’s far worse because, unlike Henry V111 , there can be no bloody divorce! Love at first sight that never wains is how I best describe it – hurt, pain, joy, ecstasy – all wrapped up together. It’s a life sentence …………… Just coming dear ! I used to have “a bit on the side” aka Spurs – but I haven’t indulged my passion. such as it was, in many, many years. We’re all in for the long haul with City wherever that might take us. No there can never be a divorce, no matter how attractive the grass might be on the other side of the fence. And look at what happened to Cardinal Wolsey and Thomas Cromwell! Yes I agree, a very good read. My first game was either Oct 57 or Oct 58 for my birthday so it is now 60 years of support with a season ticket holder from 68 to 1980 when I moved to South Yorkshire. I was at Watford when city won promotion to the old first division under Saunders and what aday I was stationed at RAF Stanmore so got to see all cities games tne next season, was at Wembley for the Aston Villa and Spurs finals and was at both the Chelsea games the replay was a bit foggy as well but it got finished. Being in a House thar has 3 Spurs and 1 Man U supporters there is a lot of banter, my brother in law had family play for Ispwich in Eddie Spearitt, but I have bever faulted in my support. Great memories, evoked by both Mick’s article and the comments. Some are special for being shared – promotion at Watford in 1971, Charlton in 2010, Portsmouth in 2011. The only time someone standing at the next urinal has ever spoken to me (I’m happy to say) was Boxing Day 2003, with the succinct but beautiful news “Huckerby’s signed”. Others are more solitary memories. I was in Germany when City were promoted in 1975, trying to get confirmation through the crackly radio.. Even more vivid is the memory of being at home following commentary of us at Bayern Munich. Amazing I didn’t wear a hole in the carpet pacing up and down throughout the second half. remember being at Highbury the day Mark Robins came on and turned it on it’s head on his debut. Two Old Wembley visits Spurs and Raplh Coates sealed it that day, little later Ray Grayson killed us off after the super cat Keelan heroics just weren’t enough. The fog almost ruing one of the Trip’s, was working in Brighton but made the trip only to make it again. In Sunderland for the promotion clinching result, got stones hurled at our car while entering the town. Think Kathy Blake was in the back while my late best mate. Was driving us. Did every game except Portsmouth away during Ron Saunders promotion season. Would I change anything perhaps only the two Wembley scores lolol. Norwich City through and through since 1962/63 season admittedly a little misty looking back now.